Everything you’ve always wanted to know about the use of methotrexate (MTX) in sarcoidosis. "Help is at hand. There’s an app for that!" 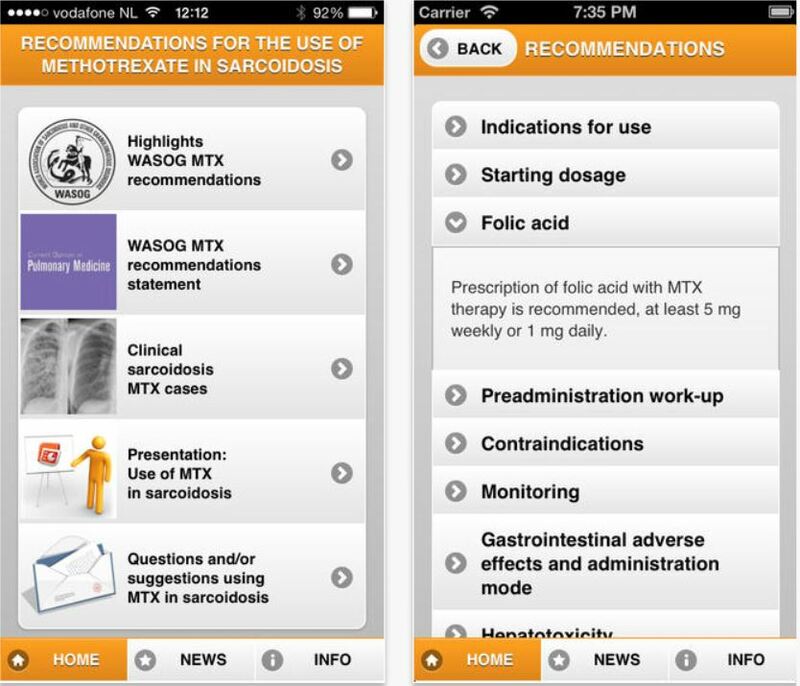 "This concise and useful app gives 10 recommendations on how to use MTX in sarcoidosis clinical practice. That’s a first!" Based on the expert opinions from the world’s leading sarcoidologists combined with evidence-based recommendations from the literature, this app provides the physician with a tremendous amount of distilled information in the use of MTX. You will find recommendations from Current Opinion in Pulmonary Medicine and links to other scientific publications, along with clinical cases demonstrating the treatment and effect of MTX. You can also ask questions and make suggestions by your own! Methotrexate is the second-line drug of choice in cases of steroid resistance or adverse steroid reactions; it is useful as a steroid-sparing agent as well. The app was developed on behalf the ild care foundation in cooperation with WASOG. The information will be continuously updated. You can find the free app in the App Store and Google Play.